Self-identifying as 'evangelical' is risky business these days. What is Evangelicalism? Is it a historical artifact? A political philosophy? A set of doctrines? A litmus test for genuine faith? Perhaps more important, what will come to mind when future generations hear something described as 'evangelical'? The authors of Routes and Radishes approach this issue from various points of influence within evangelical organizations, denominations, and institutions. They believe that the historical distinctive of Evangelicalism is too powerful and too positive to be abandoned. Yet they all desire that the Evangelicalism of the future break away from common pitfalls in the task of loving people toward a vital relationship with God through Jesus Christ. Each author brings a different but vital perspective to the conversation this book represents. They chart a path that, while not monolithic, takes seriously the past and potential of the evangelical movement. Furthermore, they invite you to digest, participate, question, and make the future of Evangelicalism a meaningful part of your walk of faith. Mark L. Russell (Ph.D., Asbury Theological Seminary in intercultural studies) is director of spiritual integration at HOPE International, a faith based microenterprise development organization with operations in 13 countries. His doctoral dissertation focused on business as mission (BAM). Mark has gained tremendous international understanding in his time living and working in Russia, Chile, and Germany and in his extensive travel to more than 70 countries to carry out a variety of business, educational, humanitarian and religious projects. Mark has been published in more than 50 academic and popular level publications. Mark lives in Boise, Idaho, with his wife, Laurie and their children, Noah and Anastasia. Allen Yeh is Associate Professor of Intercultural Studies and Missiology at Biola University near Los Angeles, California. 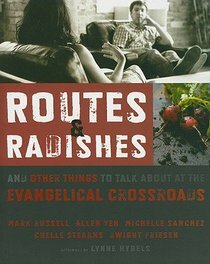 He is the co-author of Routes and Radishes and Other Things to Talk About at the Evangelical Crossroads (2010). Chris Chun is Associate Professor of Church History at Golden Gate Baptist Theological Seminary near San Francisco, California. He is the author of The Legacy of Jonathan Edwards in the Theology of Andrew Fuller (2012). Michelle Sanchez (M.Div., Th.M., Gordon-Conwell Theological Seminary), is codirector of Christian Formation and founder of a unique church-based spiritual direction ministry at Highrock Covenant Church in Arlington, Massachusetts. She graduated from Gordon-Conwell with the President's Award (highest GPA) and was also a recipient of the Michael Haynes Scholarship for African-American theological students. She has worked previously with Campus Crusade for Christ in New York City and has served in various leadership capacities with the Lausanne Committee for World Evangelization. Michelle is currently pursuing ordination within the Evangelical Covenant Church. Michelle Stearns (PhD, St. Andrews) approaches theological studies through the practice of art. She is an amateur musician and is Assistant Professor of Theology at Mars Hill Graduate School.